Etymology : from Greek: "cyparissos", which comes from Cyprus island; in Latin: "cupressus" (hence its name given by Linné). Lifespan: 500 years (very long-lived). A very old remarkable Cypress is in Mexico, in Montezuma. Its trunk measures 40 m in circumference, 3,6 m in diameter. Form (insulated tree): columnar or fusiform (in spindle) rather characteristic. Foliage persistent : scaly leaves applied to twigs. Scales smell strongly resinous when they are crumpled. Scales are of a squalid green on some remarkable Species (Cypress of Arizona). Flowers: like most anemophilous trees (which use the wind to transport the male pollen), flowers get ready from autumn and mature in February-March. The female flowers are formed of scales. The pollen is picked up by a drop micropylar. Risk of allergenic pollen : very high in Southeast of France because of the slightest humidity that in other regions. The fruit is a shining green protruding cone the first year. It takes two years to be matured and becomes dark brown. 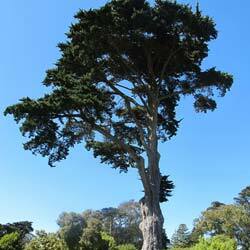 Legends and traditions: Undoubtedly because of its long life and its persistent foliage ("eternal "), Greek mythology dedicates the Cypress to Hadès, the God of the dead: its wood is used for coffins of the warriors died for Fatherland. You will be the companion of pain. "(Ovide, Metamorphoses). Is that why the cemeteries are often planted in Cypress? In another register, where it seems that passion flirts with death, the arrow of Eros was wooden of Cypress. 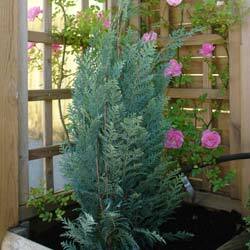 In Celtic astrology, the cypress is a passionate lover who cannot be satisfied. Other Cypresses and False Cypresses (American) : they all have leaves with scales growing in a plane (distichous leaves), unlike the cypress the branches of which are twisted in all directions. Their branches grow longer each year, and new foliage is dense enough to prevent light from penetrating to the heart of the tree so that the former branches lose their scales. 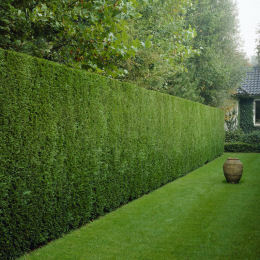 Use: these are trees typical of hedge. Even if they are pruned court, up to stems gone bald of last years, it have the capacity to re-turn green on the periphery in one or two years.